Lined up in the coastline is Al Fresco Resort. It offers to visitors, a unique experience of beach resort. If that's what you like, you are absolutely in for an adventure. That's because we have the information and review regarding this beach summer destination in Matabungkay, Batangas. Will be posting up location address, contact details, photos (if available), food and dining, cottage and room rates, entrance fee, tips on how to get there via a Google Map location pointer and other options for your Batangas resorts and hotels search. Small yet relaxing and with a bit of a cozy ambiance, this 3-Star beach resort in Batangas may be found (as stated in Google Map below) near the middle of the Matabungkay Strip. Equipped with 8 Air-conditioned rooms, a Dining Hall, Sala/Lanai area great for an afternoon rest after beach bumming, readings and a little acquaintance drinking and relaxing while enjoying the veranda view overlooking the ocean shore along the coastline. For more information, please use the details below to ask their customer service. 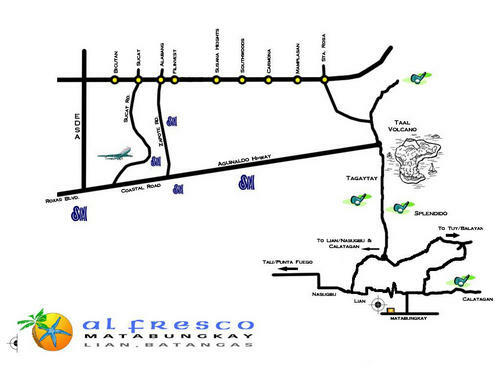 From Manila, Proceed to Tagaytay and head toward Nasugbu for 32km. Turn right after the Sea Oil Gas Station and drive 5.5 km (passing the sugar mill on your left) to the T-Junction(Shell Gas Station on the Left) Turn left and drive 12km, through the town of Lian, until you reach the Matabungkay Beach sign. Turn right and proceed 1.5km. Turn right on the cement road parallel to the beach. Al Fresco Beach Resort is on the left after about 300 meters. From Batangas City, proceed to Balayan. Turn left from the Main Highway and head towards Calatagan. After 11km, turn right on the T-Junction Drive 1.8km and turn left upon seeing the Matabungkay Beach and signboard. Turn right on the cement road parallel to the beach. Al Fresco Beach Resort is on the left after about 300 meters.